This past Friday I was invited by the Allied Arts Council to participate in their annual fundraiser the Decadent Desert Gala. Last year I participated as a guest demo artist. This year we kicked it up a level and not only did I do a live demo but completed the painting in an hour so that it could be auctioned off. Why would I do such a thing? Because I'm nuts! I was asked "well what are you going to paint? ", and I replied "something small, probably a still life". Really what I meant is that I have no idea and I will be flying by the seat of my pants till the last minute with this one. I decided to paint eggs. I have painted eggs a few times and lately I have been regularly using this setup as a project in many of my painting classes. 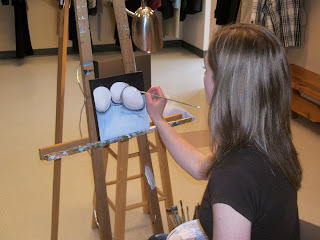 I use a limited color palette of titanium white, burnt umber, and ultramarine blue. By using this color palette and this subject matter one can discover the basics by focusing on value and warm and cool colors. It is a great way to show students that a painting can be quite beautiful when you don't use black straight out of the tube to shade everything. My favorite combination, the magic combination that never fails, is to make your really dark darks with ultramarine blue and burnt umber. It is fabulous and easy to control and manipulate. It can be applied to almost any deep dark situation. I fell in love with this combination in University while I was completing a spectacularly ridiculous painting of Elton John. The painting was of Elton in his crazy rose colored glasses that were rimed with layers of beaded wire that created huge halos around each eye bigger than his head. Most of the painting was the top view of his shiny black piano. Basically, a large high gloss back shape that took up most of the canvas. I used layers of this ultramarine blue and burnt umber combination with the final layer being quite heavy on the walnut alkyd to get a glossy surface that complimented Elton Johns unique glasses, oversized lapels, and sideburns. I thought it really captured the essence of the Elton. I think that painting is floating around Vancouver somewhere. Back to the main road after that detour, I'll get back to the subject at hand. 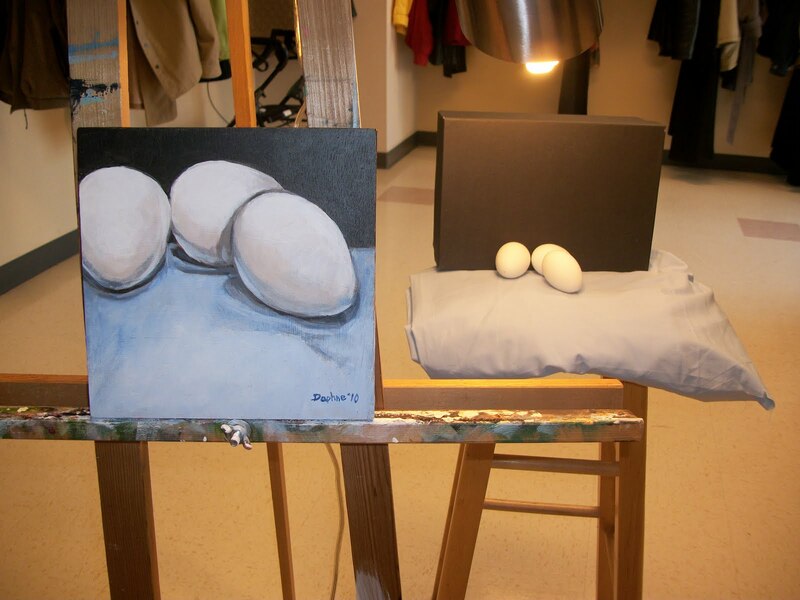 The egg painting. I had a great time painting it. I was able to focus and really get into the right mind space to lose myself in it because I was sitting a foot away from a wonderful Harp player. I had the vibrations of the strings and a strict deadline fueling my flames of production. I completed with time to spare. I was able to have a lovely meal with my friend who joined me and really made the evening wonderful. Thank you to the wonderful person who-ever-you-are that purchased the painting. It was for a good cause. I must admit I am biased but the AAC does a great service by providing the community with affordable art classes. They provide a creative outlet for many.